In 1862 William Leigh and Frederick Rathbone Burgess took over Central Pottery in the heart of Burslem, calling their new business Burgess & Leigh Ltd. Eventually the founders’ surnames would be combined to form the brand name Burleigh. In 1889 they moved to their state of the art, purpose built site beside the Trent and Mersey Canal at Burslem. Middleport Pottery was described as ‘The Model Pottery of the Staffordshire Pottery Industry’ when it was first built. It was designed to make all production processes more efficient and to improve conditions for the workforce. 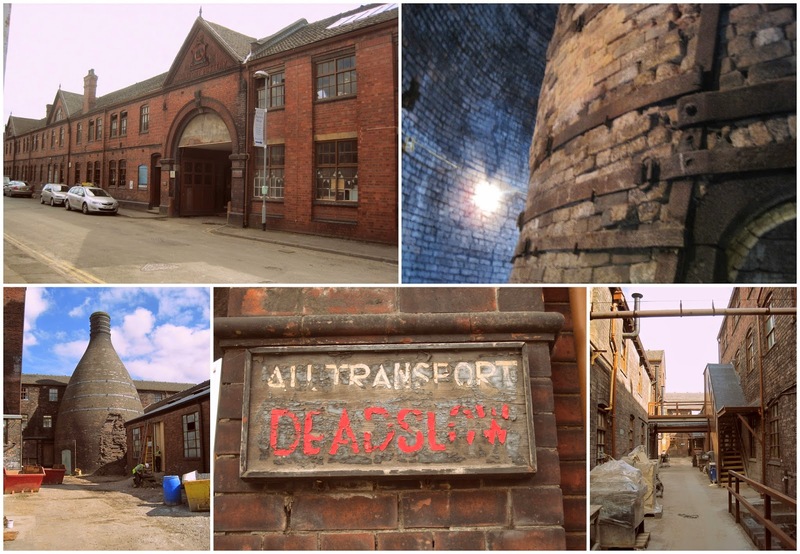 By 2011 Middleport Pottery was at serious risk of closure because of the very poor state of repair of the buildings. This would have seen the loss of jobs and substantial buildings of historic significance would have been left to further degenerate. But in the same year The Prince’s Regeneration Trust stepped in to buy and save the site and began a £9 million project to regenerate and revitalise it. The major buildings at Middleport are undergoing repair and renewal so they can continue to house Burleigh pottery production (e.g. Victorian sash windows will be repaired and re-glazed, and new conservation roof lights will also be installed). The currently redundant floor space will be refurbished for use as new workshops, and publically accessible facilities will be created, including a gallery, café, and activity space that will deliver an education programme for local schools, students and others with particular interests in art, design, heritage, craft and technology. When I arrived on the site of Middleport Pottery, I have to be honest, it was a conservation programme like none of the previous ones that I had visited in the last week. Here, the central idea and principle was to retain all layers of history and not restore the building into a pristine state, but rather let the industrial side of it- the chaos and layers of history be seen for everyone. I think that such an honest approach was the perfect way to go about the conservation works, because it displayed the pottery in its rawness and integral state. Of course the structural integrity of the buildings and the bottle kiln was restored, but the smaller architectural elements that portrayed the history of the pottery were left untouched. For example, the various decorative layers of wall paint were not scrubbed down and smoothed out but instead, the multiple layers were displayed and left untouched. When I was walking around the site with the site manager Will Prew, it was very hard to detect where any sort of conservation work had been done due to its respectful and honest approach towards the original fabric of the buildings.